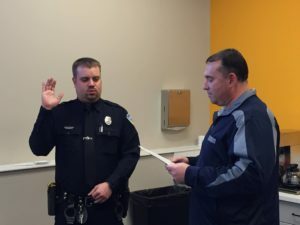 Officer Jason Wallace was recently promoted to the rank of Corporal during a recent ceremony at the Dickinson Public Safety Center. Corporal Wallace started his career as a dispatcher, and was hired as an officer in 2014. His good work ethic and natural leadership skills assisted him in getting promoted to Corporal. We wish him luck in his new position on B Shift!